So this past weekend was the last weekend of our Christmas holidays coming to an end, Katherine and I decided on a ski weekend in Valberg. Located in the southrn French Alps this quaint and scenic town was quite impressive. Booking such a trip at the last minute, especially, during school holidays, we were lucky to find a place to stay. However, after some painful (day long) internet searching we were able to locate a place the had accommodation with room that could sleep more than 2 people. Hotel Le Chatellan was a great little place to stay. This family-owned and run hotel was a perfect getaway retreat. The family is very nice and extremely helpful in providing an all-around excellent experience. From a “welcome” smile at reception to dinner in the main room complete with large fireplace to holding your luggage and ski equipment even AFTER checkout, our stay was great! Getting to Valberg is quite easy. We opted not to drive ourselves and take the bus although we met a few people that drove themselves. Either way, it’s about a 2-hr trip from Nice. We got up before dawn on Friday 0500h, caught the 0624h train from Antibes to Nice Ville station. Once here we boarded the #770 Snow Bus, operated by Lignes d’Azur, departed for Valberg at 0715h, and arrived in Valberg around 0930h. Train tickets and bus tickets were under 40€ total. There is no way that we could drive our car, find parking for 3 days, and return home for that price! No driving worries for us was perfect! Valberg from the top; Miss G ready for her first ski lesson; G lovin the snow! Settling in we found the local shop to sign Miss G up for ski school. Then it was off for rental skis, boots, and a helmet. Check. Now time for lunch at Hotel Chalet Suisse. We tried to book this place to stay but unfortunately it had no vacancy. At lunch we were greeted warmly by Christophe; who was also our waiter on a subsequent lunch on Sunday. Christophe was an excellent waiter and understands customer service. His attention to customers is what I’d expect when dining in a restaurant. We highly recommend visiting him for lunch when in Valberg; he will take great care of you. As for the food at Hotel Chalet Suisse, it was delicious and there was a good variety of choices. All too often in this region you see menus that are always geared towards tourists where they are all basically the same. Not the case here. The food was excellent but, honestly, what made our dining experience most pleasant was Christophe’s service. It goes without saying that he wasn’t French…but South African. Quite frankly after our “service” conversation, it was clear he didn’t understand the French’s lack of customer service either. Let me provide an example. Across the street was another restaurant/bar called “G”. On Saturday evening while Miss G wanted to play in the snow, we decided to sit on the outside patio and relax with a drink. After sitting for 20 mins, I decided to go into the bar for drinks. Once I ordered and only then did the staff offer to bring the drinks to us. Ummm really? Haven’t I done most of the work at this point? Then they asked me where we were sitting and when I informed them, they told me they couldn’t serve me there. Quoi? I was told to go to the restaurant area to be served. REALLY? I have $$ in my pocket and I choose to spend it at “G” bar, they don’t want it, and tell me to go buy drinks somewhere else? I kid you not, true story. Ski school was very successful for G. By the end of the 2-hr class, Miss G was ski down the small slope all on her own. She did amazing! Saturday wasn’t so successful for ski school as G decided right at class time, she didn’t want to attend. Oh well…maybe another time but she did have lots of fun the day before. All three days, we rented a toboggan sled, you know…the kind with the pull-handle brakes? Miss G enjoyed being pulled up the hill and sent down by herself. While she didn’t know how to use the brakes (except when being pulled up hill), Mommy & Daddy became the crash pads at the bottom of the short hill. As for being in the snow, Guilliana LOVED it! It’s not the first time G has seen snow but living in Arizona and now the Cote d’Azur snow makes a very rare appearance. Our weekend wasn’t quite so full of skiing but that’s okay. Getting G taken care of and ready to ski is a bigger deal. Katherine and I love to ski & snowboard! I we would like it to if Miss G would join us on the slopes. So far, all indications are looking in that direction. Yeah, baby! 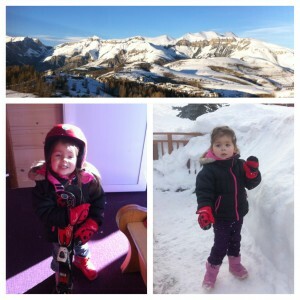 All in all, we had a great 3-day trip and where Miss G was bit by the ski bug. Now to catch that snow bus, provided by Lignes d’Azur, let leave the driving to someone else!